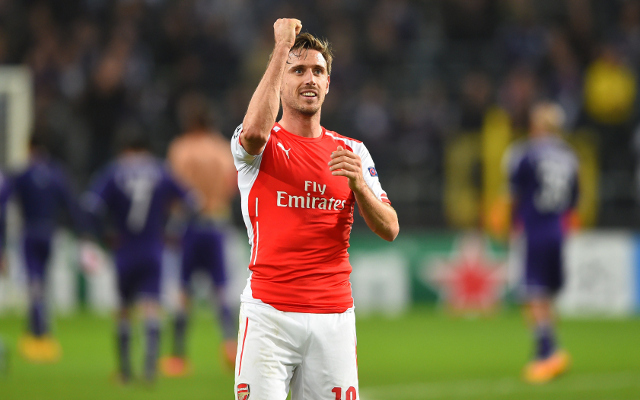 Arsenal defender Nacho Monreal has been linked with a return to Spain as according to Sky Sports, Atletico Madrid are reportedly eyeing a summer move for the 29-year-old. The La Liga outfit are keen to sign a new left back when the transfer window opens and are ready to turn their attentions to Monreal if they are unable to re-sign their first choice target Filipe Luis from Premier League champions Chelsea. Atletico are likely to face a struggle in their attempts to lure the Spanish defender back home after he has become a regular in the Gunners defence since the turn of the year. Monreal looks to have the upper hand over Kieran Gibbs in their battle to become the club’s first choice left-back and has produced consistent performances throughout the campaign even when playing as a centre-half. In the event that Monreal does depart, it would appear manager Arsene Wenger has a replacement in mind as German publication Bild have linked the Gunners with a move for Wolfsburg defender Ricardo Rodriguez.